Your daily routine is filled with decisions that impact many lives including family, employees, clients, and vendors. The range of considerations – emotional, mental, and financial – is complex. How can you evaluate, prioritize, and quantify this complexity? If you are like most owners 60%-80% of your wealth is in the business. Your personal wealth and security depends on the business to generate income and eventually to transfer wealth. Transfer risk is high for private firms – less than 20% successfully sell. What plans are in place to build value, facilitate wealth transfer, and protect you against unforeseen events? This six-step process is a framework in which we educate you on each of your options. We help you clearly identify and quantify solutions so you can design a plan that can work best for your goals. The transition process begins with setting goals and asking some basic questions: Can you afford to exit your business and maintain your current lifestyle? What is your timeline? 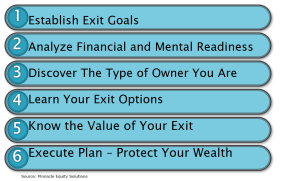 Do you want to remain in the business or leave? Will you transfer internally to a family member or key employees? What risk do these options pose to you? Are you thinking and planning in pre-tax or after-tax dollars? Will you have enough to support your lifestyle beyond your working years? Successful transitions don’t happen without thoughtful preparation. Where to begin planning for the next 5, 10, or 15 years? The investment, insurance, tax, legal, and valuation considerations require specialized knowledge and a process to be sure the pieces of the puzzle are working in unison. Internal and external transfer options generate different values and tax consequences. What range of values can you expect under your best, likely, and worst case assumptions? Your options will be limited without a process, preparation, and a plan. Will You Be Left With a Value Gap? Analyzing your current savings and the asset base required to fund your future spending needs defines the Value Gap. If you run expenses through your business this will require adjusting those expenses to an after-tax basis. Long range planning also needs to estimate inflation’s impact on your purchasing power. This initial assessment needn’t be precise. In this phase we are trying to stimulate your thinking about the change in mindset as you contemplate your transfer options. Accumulation and growth is a much different way of thinking than distribution and preservation. Business owners very often fail to take this into consideration as they near retirement.